Business Card for the Bombay Inn restaurant in San Francisco, described as "The Only Place in the West Where Genuine Indian Curry is Served." The back of the card provides a menu. Business card for Sindbad Restaurant in Leicester Square, London. The card advertises "English, Continental, Pakistani, Indian, and Other Oriental Dishes." 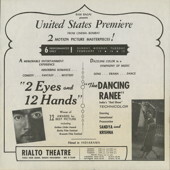 Advertisement for the American Premiere of the film Sandya the Music Maker at the Richelieu Cinema in San Francisco on April 27, 1966. Advertisement for the services of the chiromancer Hassan, a "man who tells your possibilities." Hassan apparently also appeared in several films, including Kim and The Day the Earth Stood Still. Promotional flyer for the 1958 album titled Great Music of India. According to the flyer, the album was packaged with a "free package of… enchanting Indian Incense" and a 20-page illustrated booklet with translations and background information about the music and sheet music for the Indian national anthem.